With its mineral spirits base, MasonrySaver Solvent Base Water Repellent is an ideal maintenance product for previously treated surfaces as the mineral spirits carrier will allow the product to bond with surfaces that have previously been waterproofed. 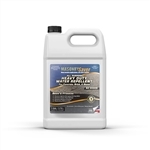 MasonrySaver All Purpose Heavy Duty Water Repellent is a proprietary blend of silanes and siloxanes creates a "SaltShield" barrier on concrete surfaces, for greater resistances to the deteriorating effects of road salts and de-icing chemicals. 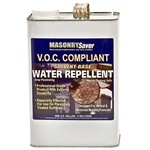 MasonrySaver VOC Compliant Solvent Base Water Repellent works the same as the regular MasonrySaver Solvent Base Water Repellent. If you live in a state that has adopted the California OTC Standards, you will need to use this VOC Compliant product. It's ideal for retreating previously waterproofed surfaces.